Establish a connection with the receiver of the email just by attaching the impressive eMail Signature with every thanking email you send to the charity donor. 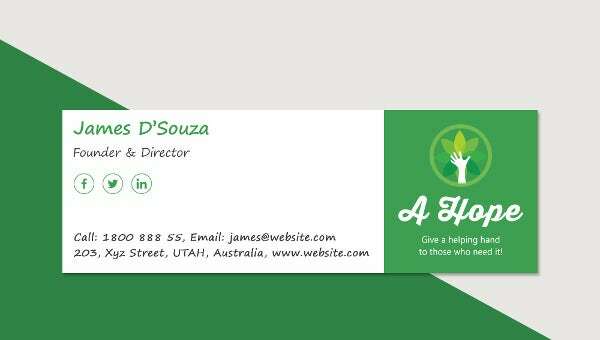 Being a member of charitable trust having an email signature is a must and our remarkable signature design will help you to create it as it will present your profile including your name, designation, contact number, active social media account, etc. in a pleasant way. The bright and lovely colour combination of the email signature with the appropriate details of the charitable trust makes it look truthful and trustworthy. For promoting, the charity events, functions or campaign, attach this incredible email signature along with every promotional mail.